Let us count the reasons as to what you NEED The Perfect Umbrella! When it comes to making you a quality product, we're all over it! 100% customer satisfaction is our #1 priority. 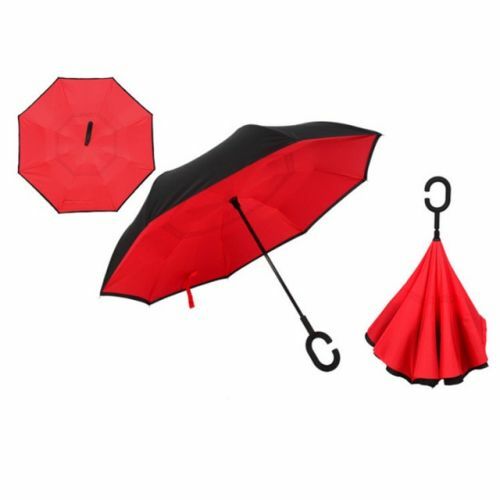 The Perfect Umbrella is made to withstand all types of bad weather conditions, especially rain storms. It is guaranteed to keep you dry! We give you our word that The Perfect Umbrella will last for years to come. You'll be thanking your lucky stars that you have it because it is worth every penny. Not only does the umbrella keep you dry but it looks fashionable, too! It sports a high-quality design of 300 pixels per inch. This umbrella makes the different weather seasons a whole lot easier. Makes a GREAT gift! Our umbrella is designed in reverse. yep. you read that right! This design is what keeps your floors and car dry when you close it. No more leaky water drips all over your things! All you have to do is click the button and the umbrella pops right up, even in confined spaces! It's far less awkward to open than conventional umbrellas, and safer, too! You never have to worry about poking someone in the face or eyes. Our umbrella is designed to stand up on its own! The wet part of the umbrella stays tucked away neatly inside so that no water drips onto your floor or car. Such a convenience! Did you know that The Perfect Umbrella is made with an aerodynamic design? It'll stay intact even during the wildest wind storms. How amazing is that?! If the canopy happens to flip, all you have to do is push the button to set it straight again. Easy peasy.